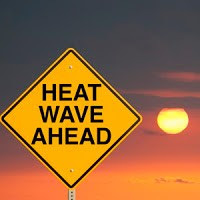 Hot weather just prior to an active W.D. A W.D. has been active with 20-40mms of rain in many places across Pakistan today. Days have cooled down, with Islamabad recording 14c as the day's high today. Max Day temperatures of 6th. Even as the W.D. has become active over Pakistan, and Kashmir,today we see the day temperatures rising all over the Indian region, excepting Kashmir. The map above shows the Western half of India in the high range of 32-36c today. Elsewhere in India too, the days were high, and above normal temperatures are seen in the anomaly map above . Now, this is just the "pre" heat of the approaching system. The active western disturbance is likely to affect western Himalayan region and plains of northwest India from tomorrow onwards. Rain/snow will occur all over Kashmir and over Himachal Pradesh from tomorrow for next 2-3 days. Rain/snow will commence over Uttarakhand from Sunday, and increase thereafter.The hill stations and tourist resorts in both the states will get a fresh sprinkling of snow. Some thundershower activity may occur over Punjab and Haryana from tomorrow and this activity may extend into Rajasthan and Kutch regions. Central and east India will see precipitation commencing on 8th and 9th February. More detailed reports of the W.D. later. For Mumbai, it will be a partly cloudy Sunday, with the day around 30c, and no signs of real cooling at night (22c). Monday will also be partly cloudy, but we should see some cooling from Wednessday thru Saturday. A windy Wednessday and Thursday, will bring the temperature down to around 27c in the day and nights can be around 17c. Suburbs may go down to 14c. Pleasant weather for Mumbai till Saturday.